(Open NOW) Adrian’s Facebook Contest! We all like to WIN and this week, we have TWO opportunities for you to be a WINNER on the Adrians Boutique Facebook Page! 4. Leave a comment mentioning the item. It’s that simple! $25 Adrians Gift Certificate Winner announced Thursday! You’ll love browsing through 32 Pages of beautiful clothing, scarves, jewelry, and accessories. Check out our One Minute Manicure13-pocket Purse Organizer, our Pocket Plus (I love this item!) on page 9, and the garden items on page 15. We also have great gifts for Mom, such as the Secret Jewels Candle on page 17, and fun and functional kitchen helpers on page 20. If you’re a Tervis Tumbler fan, check out the new designs on pages 22 & 23. Wine drinkers will like the Corkcicle Air and Vinnebago on page 25. Adrian’s also has fun toys, games and puzzles for kids. Check out the cute Bling2o Swim Goggles and Woboba Ball on page 26, and the Modarri Toy Cars on page 27. To prompt kids creative side…you can’t beat Klutz books for inspiration, and Melissa & Doug toys which are shown on pages 30 & 31. EVERYONE will want to go to the back cover for some EXTRA special buys such as a FREE pair of Jelly Wave Flip Flops when you purchase our super large tote, and our extendable Selfie Pole for taking selfies! 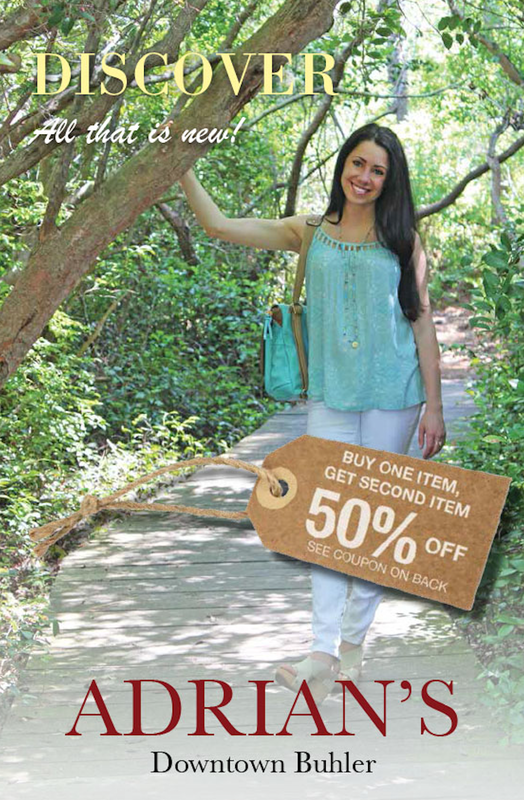 Of course, you’ll want to check out our Buy One Item, Get Second Item 50% off coupon on back cover. There is no need to PRINT this coupon…Just mention Coupon Code SIM15 before checking out at the register. THANK YOU for checking out our NEW catalog! Good Luck to you on the $25 Gift Certificate! March/April showers are bringing beautiful spring flowers this year! Share your photos with the Adrian’s Boutique Family and have a chance to win a “Rain-a-Way Poncho (Value $34.99)! 😀 Post your favorite picture of a blooming shrub, tree or flowers in your yard to our Facebook page and we’ll pick a winner Friday nite, April 24th! The winner will receive a Rain-A-Way-Poncho w/ hood – retail value $34.99. 2. 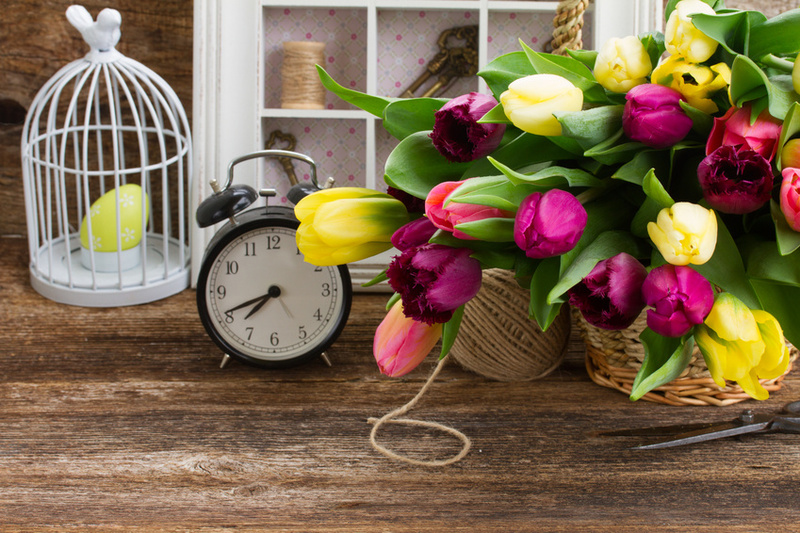 Leave a short comment and post a photo of your spring flowers to our page. 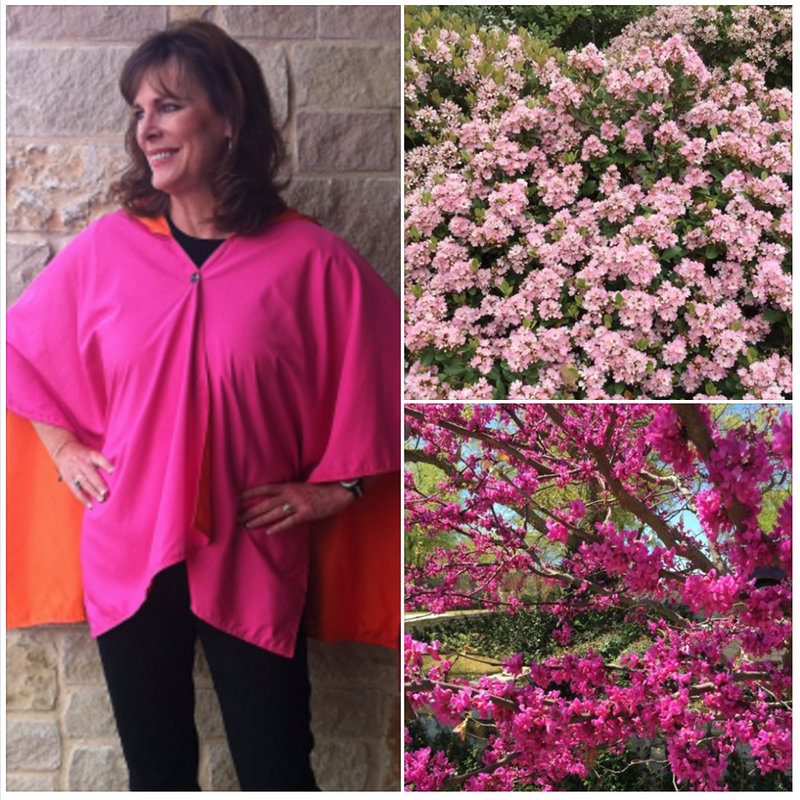 Thank You to our beautiful model, my friend, Connie Gauntt from Arlington, TX for showing off our poncho! Good luck! I want to keep this short & sweet, but don’t want to forget to invite you to join us out at Stutzman’s Greenhouse in Pleasantview, KS for “Party on the Patio” on Thursday from 4-8 pm. You’ll enjoy snacks, learn new grilling techniques and enjoy mini-workshops while browsing through the huge greenhouse filled with Stutzman’s BEAUTIFUL flowering plants. 6 pm. Join Sandy, Jane & Vicki from Adrians Boutique plus all of our beautiful models for a Spring Fashion Show. FREE Adrians Boutique Goodie Bag for first 100 guests at the Fashion Show, plus give-aways throughout the entire show! 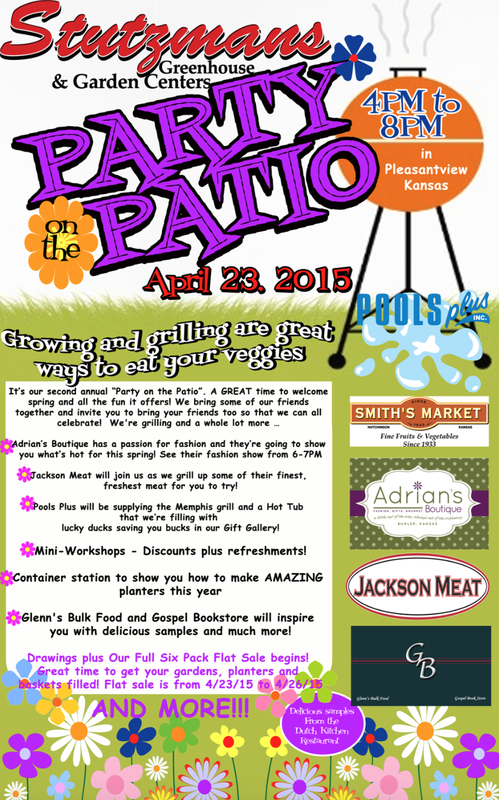 *Jackson Meat will join us as they grill up some of their finest, freshest meat for you to try! *Pools Plus will be supplying the Memphis Grill and a Hot Tub that they”re filling with “Lucky Ducks” to save you bucks! *Mini Workshops, Container Station, Drawings, PLUS Stutzman’s Famous Full Six Pack Flat Sale (love that!) begins Thursday evening! NEXT WEEK… Don’t miss the Adrian’s Boutique SPRING OPEN HOUSE! Watch your email on TUESDAY for all the details! You know we love to SPOIL our customers…and this event will be no different! Plan to come out Wednesday, Thursday, Friday or Saturday and enjoy all of our new arrivals. Call a friend and get your special Girlfriends Road Trip to Adrian’s Day on your calendar! As always, we appreciate you and are always here to serve you. Thank you so much for being a part of the “Adrian’s Family” for the past 32 years! This is National Small Business Week and Adrian’s Boutique has partnered with Jeni & Drew Bryan of Jackson Meat to create awareness of the benefits of shopping, eating, playing and keeping our dollars local! 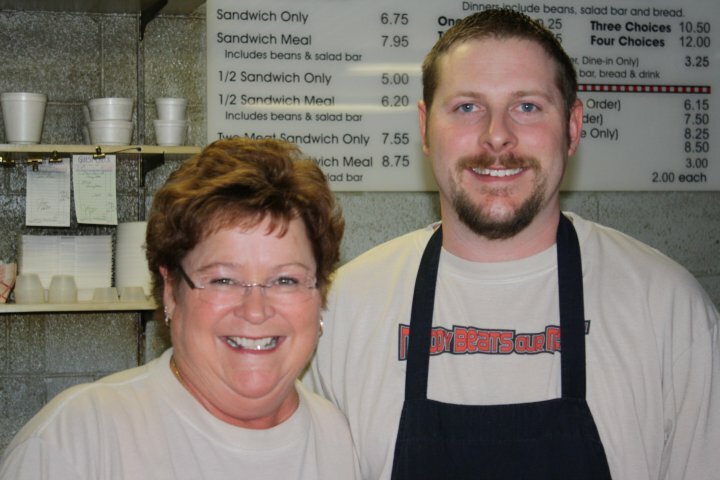 We are so blessed to have some OUTSTANDING businesses in our community, and Jeni & Andrew own one of them. They have owned Jackson Meats for about 3 years and already established a reputation for quality products, excellent customer service and involvement in our community. 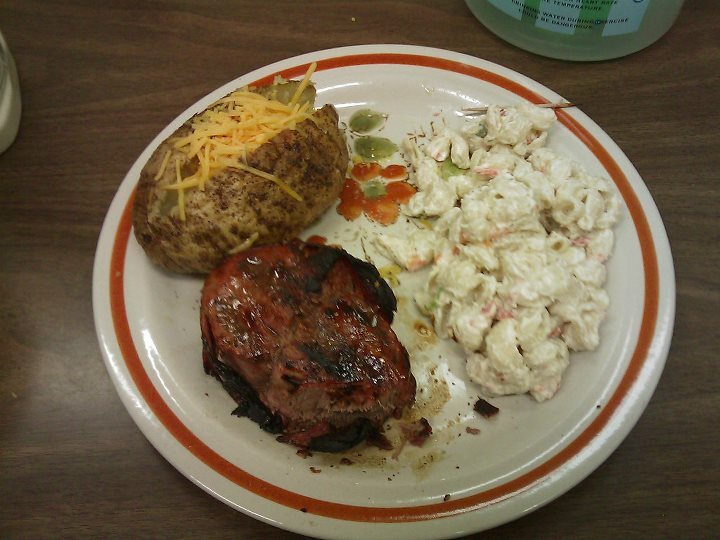 Jackson Meat has been serving the Hutchinson/Reno County Community since 1946…The Bryan’s have continued the tradition of the highest quality beef, pork & chicken, along with delicious cheeses, seasonings and other products. One of several meat counters…filled with delicious-ness! 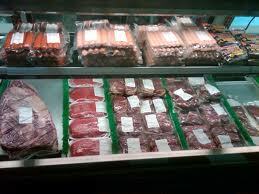 If you love to GRILL, and want the highest quality meats available, Jackson’s is the place! 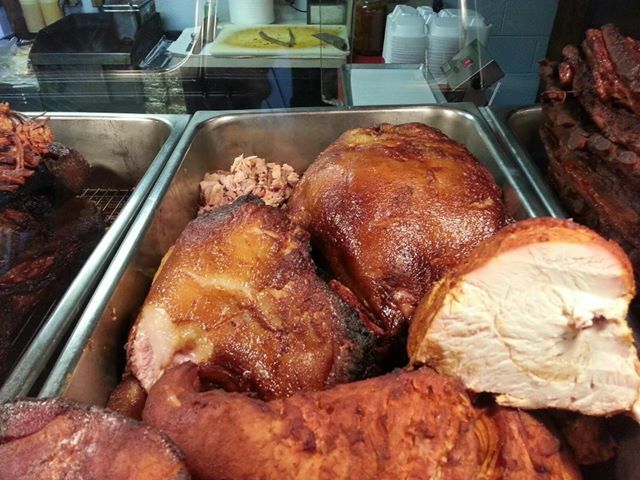 PLUS, their staff is very friendly and knowledgeable and can help you choose just the right cut for your meal. This is my recent purchase from Jacksons. Some delicious Pepper Smoked Bacon, Bacon Wrapped Filets, Colby Jack Marbled Cheese, some DE-LICIOUS Smoked Sharp Cheddar, and of course, hamburger for the freezer. 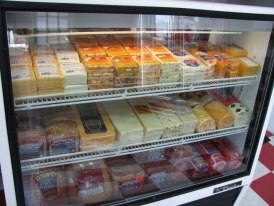 I love the choices of cheeses and cold cuts at the Jackson’s Counter…and they will slice and package just the way you like it! A great meal from the grill…Bacon wrapped Filet from Jackson Meat. Jeni Bryan (left) will always greet you with a smile! We are so proud of Jeni & Andrew and all that they have accomplished with their business. 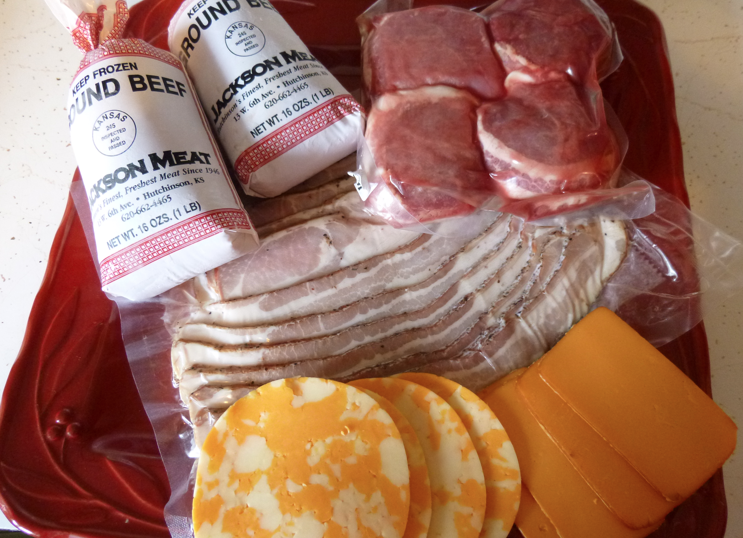 If you’ve never stopped by Jackson Meat, you are missing out on a great local place to find the very best meats, cheeses, sausages, seasonings and so much more! They will take great care of you and want to be sure your are happy with your purchase. I hope you’ve enjoyed the “TOUR” of Jackson Meat. They are located at 13 W. 6th in Hutchinson…. Please visit their Facebook Page and click the “LIKE” button…then drop by and pick up some steaks or burgers for this weekend! Adrian’s Boutique, along with our Six Small Business Week Partners, are giving away $1,400 in Local Gift Certificates this week to celebrate National Small Business Week! Just stop by any of the following locations to enter. No purchase necessary to enter. Must be 16 or older to enter. This is National Small Business Week and Adrian’s Boutique has partnered with Roy’s Hickory Pit BBQ to create awareness of the benefits of shopping, eating, playing and keeping our dollars local! We are so blessed to have some OUTSTANDING businesses in our community, and Anne Armstrong and her family own one of them. 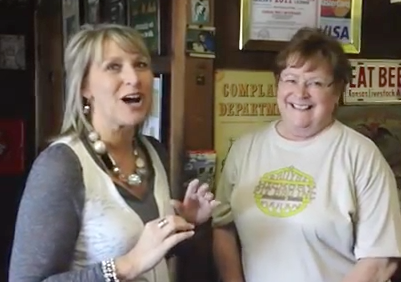 They have built a “SMOKIN’ BBQ Business way out on West 5th Street in Hutchinson, Kansas over the past 30 years! In our family, we always say “You can’t SNEAK to Roy’s! (You can try, but you never get away with it! )” That delicious SMOKEY fragrance will give you away every time! Anne & Ryan can whip up some MEAN BBQ! There is NOTHING on the menu that I don’t like! 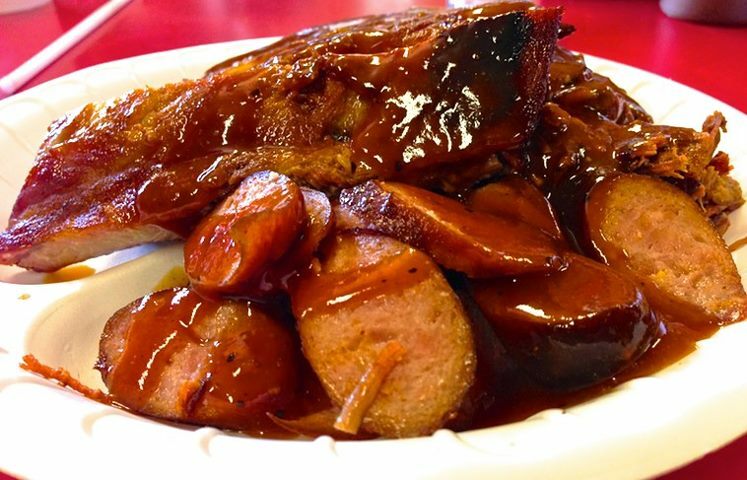 Ribs, Mild Sausage and Brisket… I can almost smell this sitting here at my desk! It’s time for a Road Trip and a Fill ‘er Up Lunch! 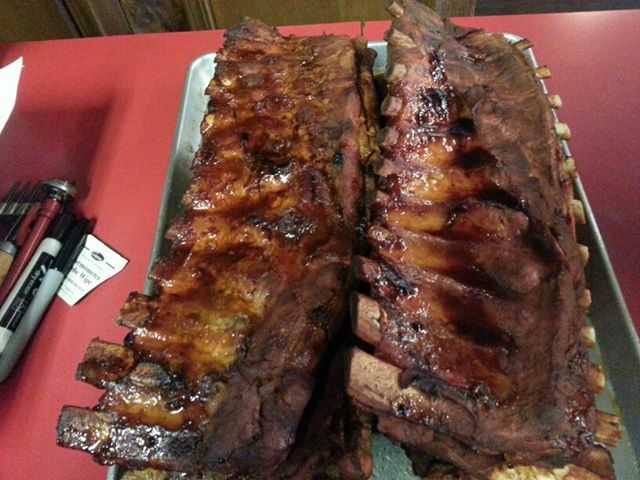 Ribs…Right out of the Smoker! Mmmm…All we need is some Roy’s Sauce! Smoked Pork Shoulder and Turkey (One of my favorites!) The Turkey is just so moist and flavorful! Mmmmm…..
Anne (right) is just one of my favorite people on the PLANET! She is a wonderful business woman, has always been supportive of us at Adrians, and is such a positive ray of sunshine right here in our community! If you’ve never made the trip out to the little yellow building at 1018 Nickerson Blvd. (aka 5th Street), Hutchinson, KS, please do yourself a favor and head out there THIS WEEK! They OPEN at 11 and serve until the food is gone, usually between 2 & 3 pm. The food is ALWAYS served hot, fresh & delicious! I hope you’ve enjoyed the “TOUR” of Roy’s Hickory Pit BBQ… Please visit their Facebook Page and click the “LIKE” button…then drop by for a delicious lunch sometime this week! This is National Small Business Week and Adrian’s Boutique has partnered with Stutzman’s Greenhouse to create awareness of the benefits of shopping local! We are so blessed to have some OUTSTANDING businesses in our community, and Ben & Marlene Miller of Pleasantview, have built a truly “beautiful” business. These are just a few of the photos I took on a recent visit out to their Apple Lane location on the Northeast side of Hutchinson. The plants are very lush and healthy! 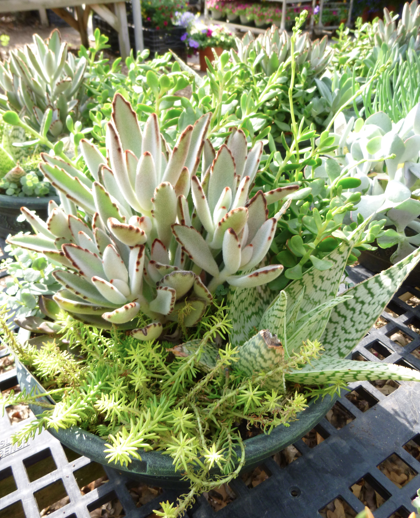 I have never personally tried to grow succulants but they look pretty hardy! 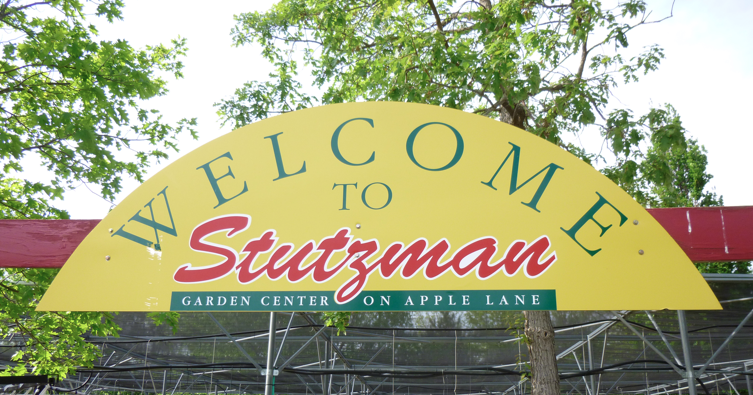 A very welcome sign in the Spring and again in the Fall… You’ll love Stutzman! 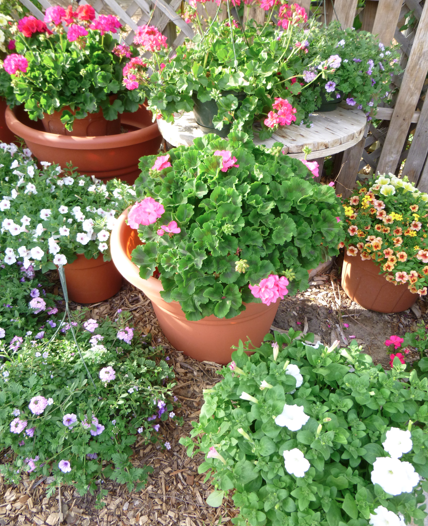 I love the beautiful flowers…they just do a great job! 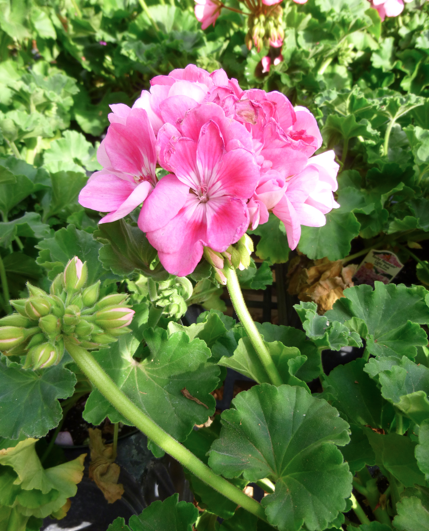 I hope you’ve enjoyed the “TOUR” of Stutzmans Greenhouse… Please visit their Facebook Page and click the “LIKE” button…then drop by for a visit sometime this week! This is National Small Business Week and Adrian’s Boutique has partnered with The Mustard Seed in downtown Buhler to create awareness of the benefits of shopping, eating, playing and keeping our dollars local! We are so blessed to have some OUTSTANDING businesses as neighbors right in our community, and Cameron & Cindy Kaufman own one of them. 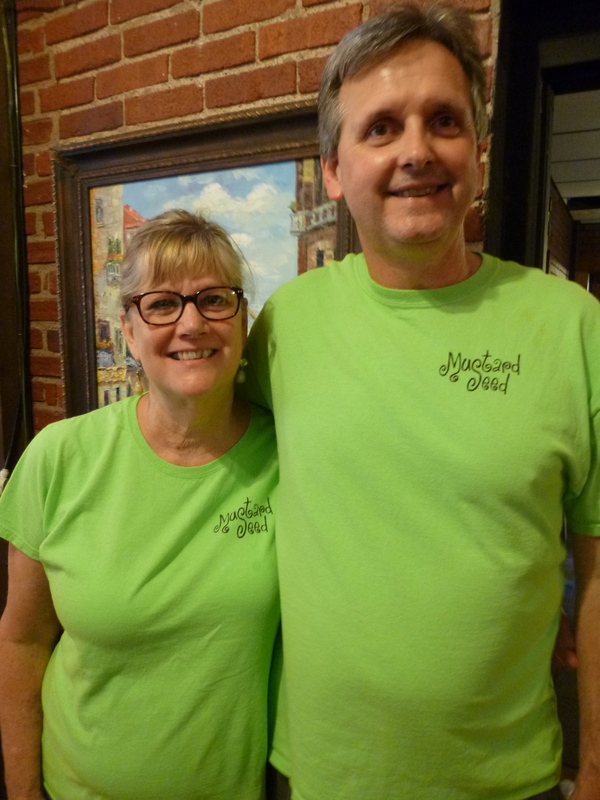 They have built quite a business that brings people from all over the region to enjoy her delicious cinnamon rolls, sandwiches, quiche, soups and desserts. 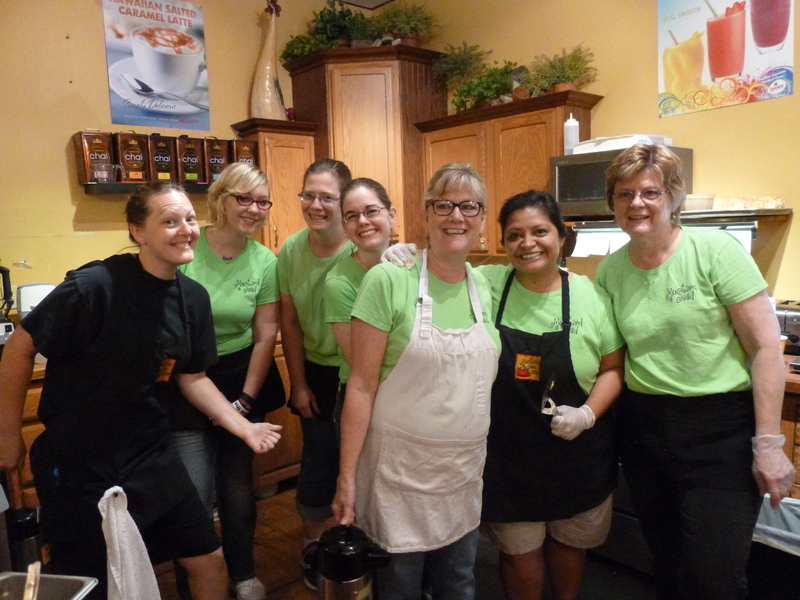 Cindy and her staff at The Mustard Seed work hard to be sure that your experience will be a good one, every time you stop in for breakfast, lunch or a snack! Cindy makes different types of quiche throughout the seasons, and there’s not one that isn’t delicious! 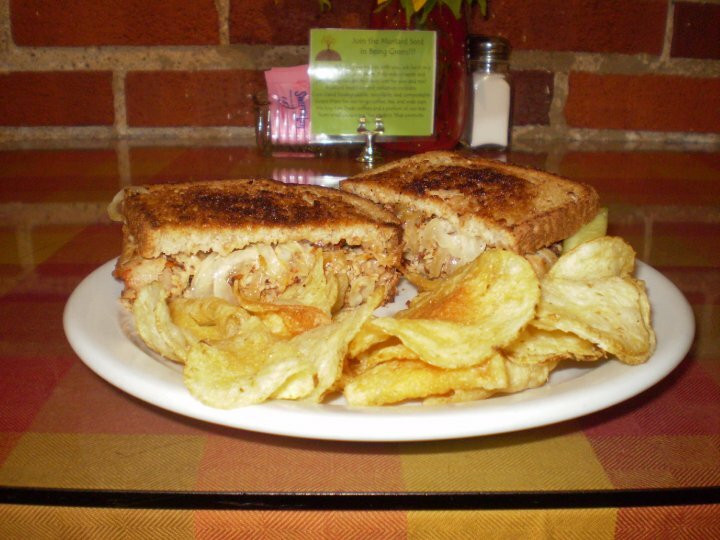 This is a Red Turkey grilled sandwich… Mmmmmmmm! 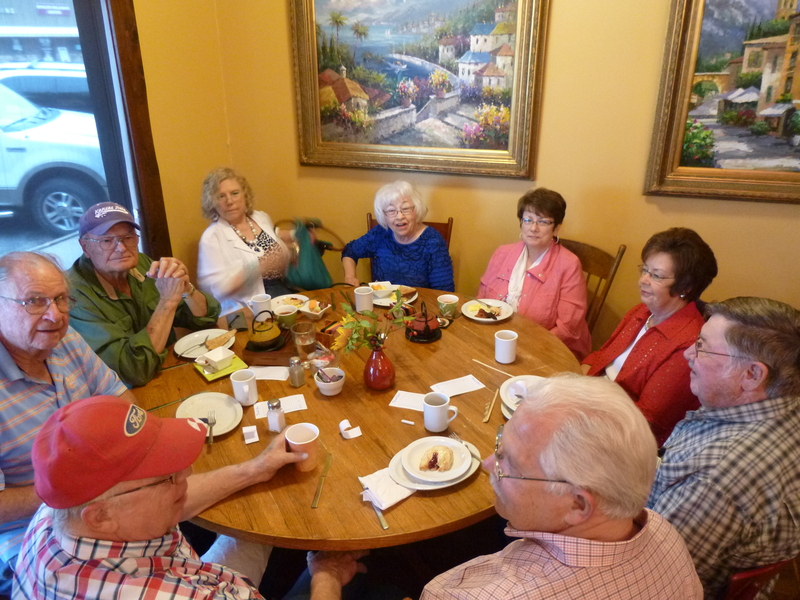 The Mustard Seed is a GREAT place for the community to gather and catch up on all of the latest news & happenings. This great group of neighbors has a standing Saturday morning Breakfast appointment, and has done this since the day The Mustard Seed opened in 2004. What a great tradition! Everything served at The Mustard Seed is made from scratch and I promise you, you will LOVE the experience of eating here! 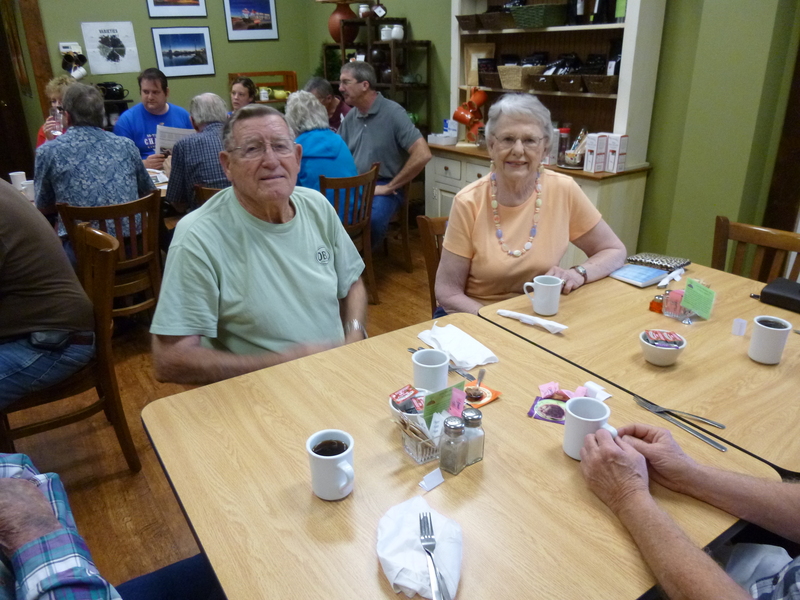 Jim & Evelyn McIver from Buhler and their table of friends rarely miss a Saturday morning at The Mustard Seed. Their coffee selection is outstanding, the homemade Cinnamon Rolls and everything else on the menu is delicious as well. 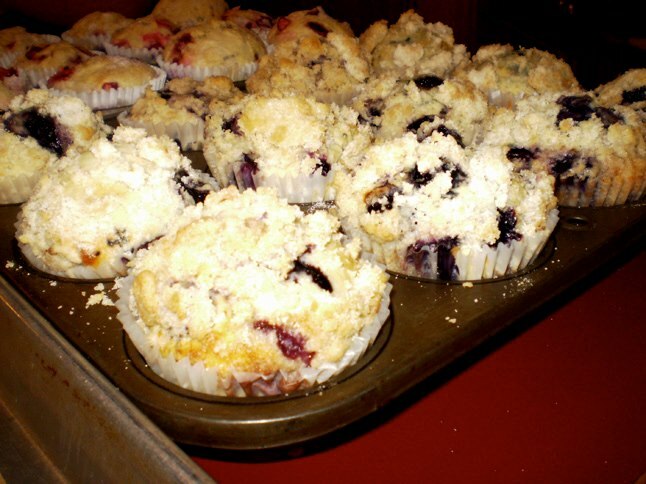 Homemade Blueberry Muffins…Oh my! My! My! 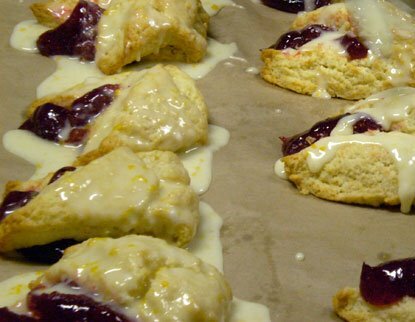 Raspberry Orange Scones…A Saturday specialty at the Mustard Seed. 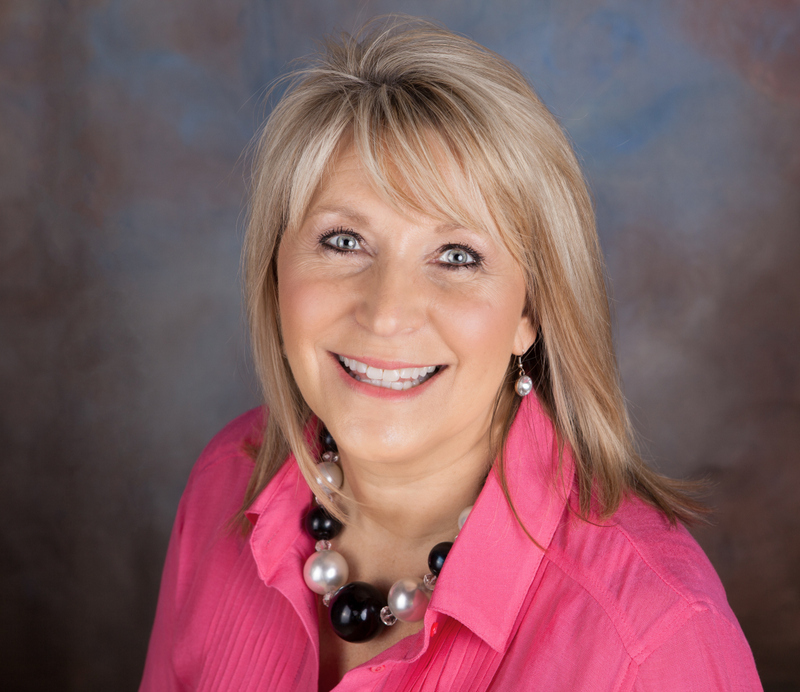 Cameron & Cindy Kaufman… Buhler is BLESSED to have you as a part of our community! Do yourself a favor and make the short drive to Buhler… You will love The Mustard Seed and all of the other delightful small businesses in our town. 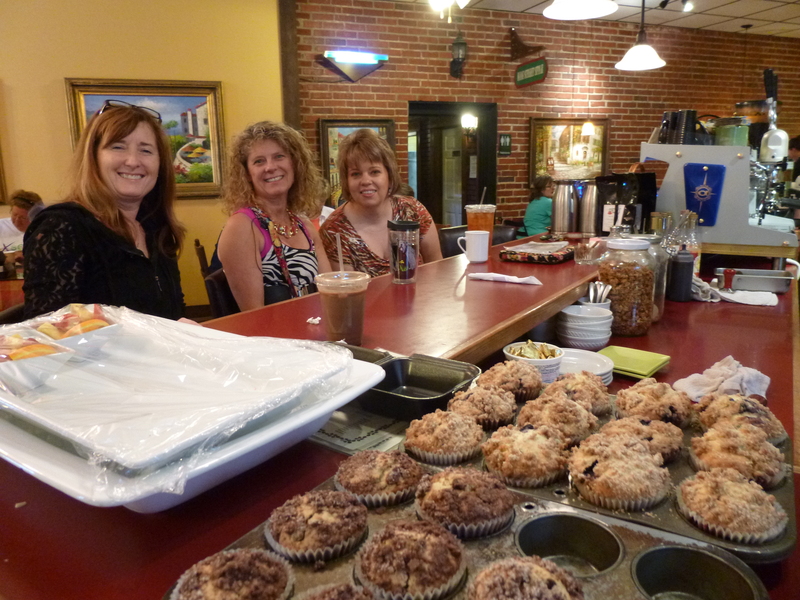 The Adrian’s Boutique girls have breakfast and/or coffee almost every single morning…if we’re not there, we are (literally) out of “the country!” This is a GREAT PLACE and we are so blessed that the Kaufman’s chose Buhler to plant their coffee shop in. Thank you Cameron & Cindy for partnering with Adrian’s Boutique once again to bring attention to Small Business Week. 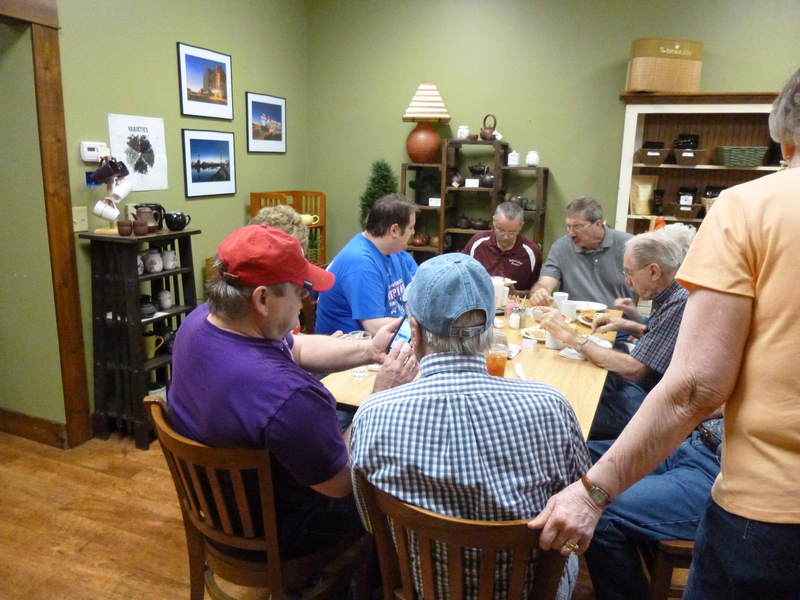 I hope you’ve enjoyed the “TOUR” of the Mustard Seed in downtown Buhler… Please visit their Facebook Page and click the “LIKE” button…then drop by for a delicious breakfast or lunch sometime this week! Hours are Tuesday-Saturday 8:30-4.